A leader in the television and entertainment industries, CBS approached [x]cube to build a unique game to celebrate Star Trek's 50th anniversary. For people who grew up watching the popular series Star Trek through its various generations and movies, CBS is a household name. 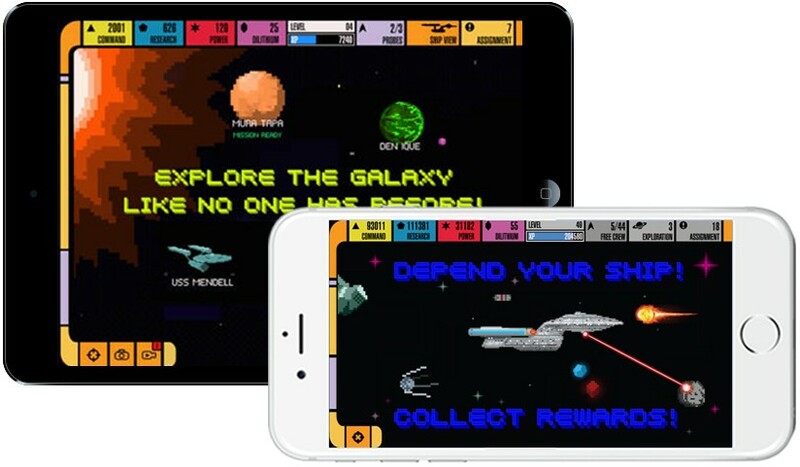 Understanding the impact of mobile and gaming on its audience, the media giant has decided to give the new generation of fans a gaming app to keep them hooked on to the Star Trek cult. With its futuristic thinking and experience of creating a make-believe virtual world, CBS was looking for a partner to help them celebrate Star Trek's 50th anniversary with elan. They approached [x]cubeLABS to leverage its expertise in developing brilliant gaming apps, and the result was Trexels. To enjoy an authentic Star Trek experience, and the pleasure of building and commanding a spaceship while leading the team through crisis after crisis, and conquering aliens using new combat styles is like a dream come true for gamers. Through Trexels, CBS wanted to take avid fans of Star Trek back to the era when the Original Series was telecast. True to the spirit of the 1960s, we used the vintage style and pixel art in developing this game. In a way, the game celebrates the Original Series' style and era, and also becomes an ode to the retro days of game design - and that's what makes it unique. In terms of gameplay, it balances resource management, spaceship construction, and exploration quite well. Keeping in mind the main storyline, the users are given an entire starship - albeit incomplete - to build, take command of, and explore the galaxies. 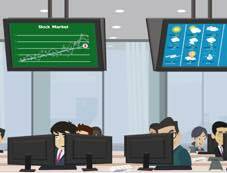 Users need to construct various rooms, make them profitable and use those resources to buy more rooms. The game is true to the Star Trek theme, the crew and the language. The character art, the game art, George Takei's voiceover narration, original music from the Original Series are other value-additions that make the game stand apart. CBS has left the entire game design and the balancing part to us. They were happy with our pitch and wanted to see our prototype to check if it was suitable. When we incorporated the suggestions they made, they knew we were on the right track and didn't get too involved in the development or the design except to make sure the game is true to the spirit of the original series/movies. As they were a bit apprehensive initially about the depth of our knowledge on Star Trek series, CBS assigned us a full-time a person to review our work in terms of storylines, characters, setting, theme, language, etc., and suggest changes, wherever necessary. 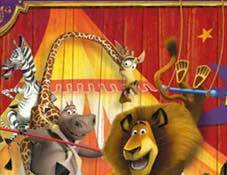 Our collaborative effort ensured that the look & feel, storyline and content were authentic. Our designers watched all episodes of the Original Series and spent about 2-1/2 months to research and completely understand the concept called Star Trek - storylines, characters, how they spoke, the jargons used - which helped us immensely. When a game is based on a popular show, thousands of fans invariably start using it. Even a minor mistake in terms of design, characterization, or storyline makes them unhappy as they are attached to the show and wouldn't settle for anything less than authentic. 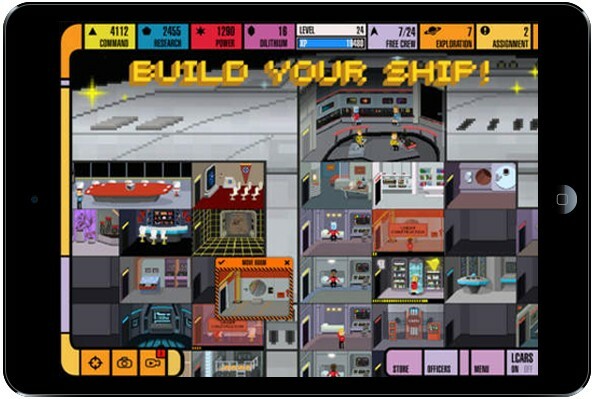 Build Your Ship: Take command of the starship, make it complete by adding rooms, arrange them and decorate the ship as you like. Handpick Your Crew: Purchase famous characters like Captain James Kirk and Spock to progress faster and reach the next level. Train your crew and assign them exciting tasks. Lead Your Team: As captain of your spaceship, lead your team through various combat and diplomacy challenges to defend your ship. Win numerous prizes and with each new level, take up more interesting challenges. Mini Game & Collection: Collect your most favorite characters from the show, and play the mini game if you want to do something else within the game. Go Exploring: The crux of Star Trek is to explore distant galaxies. So, keep exploring galaxies, planets, new life, and new civilizations. VIP Collection: Who can forget VIP officers like Lwaxana Troi, Q or Chapel? Bring these VIPs on board and make them part of your crew to win unique challenges. Customize Your Ship: Collect officers & special officers across generations, buy uniforms from various eras, decide on how you want your ship & crew to look. Upgrade: Purchase and build a new spaceship, and get new uniforms for your crew to upgrade to the next generation. As the game has many elements, planning the entire architecture for the backend setup was our biggest challenge. We brainstormed to figure out how things will fill into one another, what are the elements we need and how to set them up. It took us a while to set up the Social Kinesis architecture. 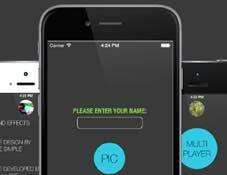 The game was complex and it was a big challenge for us to make it simple and easy-to-use. After the soft launch in Netherlands, New Zealand and Australia, we realized that it is too cumbersome and it generates a lot of info. So, parallelly we were working on streamlining the Social Kinesis design into this by getting rid of unnecessary fields and object modes. We had a bunch of dummy server setups and when we landed the game on them, we noticed the mistakes we made and rectified those, besides changing our original architecture design and updating the resolution. We revised the entire Social Kinesis architecture. The initial prototype of the game was quite different from what we have built right now. There were a few unused things in the initial belt and we removed those specific defunct elements/fields from the backend. The developers had to make sure that the code supports these changes. We streamlined the pricing elements and instead of handling multiple tables, we aggregated them into a single table. It took us around 9 months to release the first version. But now, we make a new release almost every month where we fix bugs, introduce a new element, or update content. The scope is so huge and we've not even reached the halfway mark. We've so far covered only 2-1/2 of the shows. In our game, the Original Series and the Next Generation are well represented. We're currently working on the Voyager series. Then there is DS Nine, followed by Wrath of Khan (Part I & II), and the three latest movies. We've a road map planned for the exciting next releases - characters from new shows, ship designs and sectors (planets, galaxies and stars) you can explore, aliens you can encounter. Parallelly, we're working on reducing/removing elements not required in the game. With this retrospective game, CBS not only benefited in terms of branding but also succeeded in celebrating Star Trek's 50th anniversary in style. 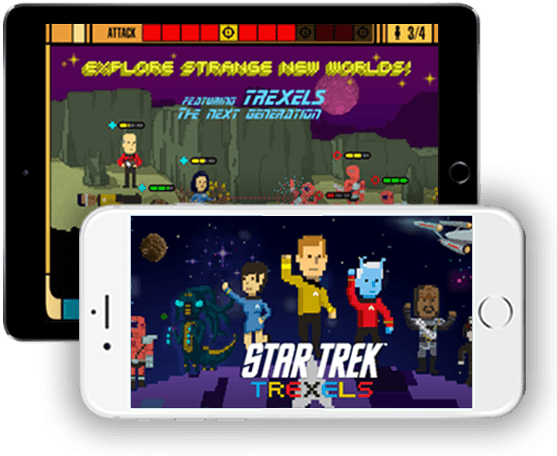 Trexels is like a chronicle of the journey of CBS - from the days of Star Trek's inception to where it is headed. It tells their story as well as the story of Star Trek characters. TV interviews with US news channels and CBS' promotional content helped promote the game in multiple ways. George Takei's voiceover was a huge draw which got us a lot of users. It was the biggest game we've done and in terms of revenue too, it achieved great success.